When the UN was formed at the end of WW-II, the Allied victors dictated the composition of its Security Council. The Security Council was formed with five permanent members with veto power — the US, UK, USSR, France, and China. All except China were among the victors in the War. When India was offered permanent membership in the UN Security Council, Jawaharlal Nehru ceded the membership to China. More than seventy years after WW-II, lots of water has flown under London Bridge, and the UK’s clout has been shrinking globally. British cartoonists portray the UK as a vassal of the US. 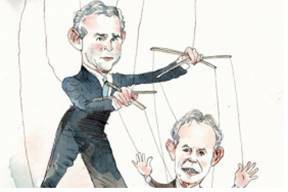 See the cartoon on the side showing the British premier Tony Blair as a puppet of President Bush 43. It is time to seriously question the legitimacy of the UK’s permanent membership in the Security Council with veto power. With its exit from the EU in 2016, the legitimacy of the UK’s disproportionate global presence came into rebuke this November in three elections in one week. First, the UK saved face by withdrawing from an impending defeat for a seat in the UN’s 15-member body of the International Court of Justice (ICJ) in The Hague. 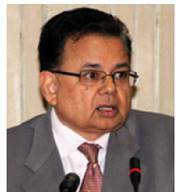 The UK’s Christopher Greenwood withdrew from the election and ceded the seat to India’s Dalveer Bhandari (see the picture) after several rounds of deadlocked elections in the UN Security Council. To be elected to the ICJ, candidates need to get a majority votes in both the UN’s General Assembly and the Security Council. Bhandari had an overwhelming support — close to 2/3 of the votes — in all the rounds of voting in the UN General Assembly. In the 15-member Security Council, Bhandari fell short by four votes. Bhandari was sure to get over 2/3 of the votes in the General Assembly. If this happens, it would be difficult for the Security Council to ignore. Further, after Brexit, even in the Security Council, the UK’s clout has waned. So, Britain ceded the seat to India. For the first time since since its inception in 1945, UK has no representation in the ICJ. This entry was posted on January 6, 2018, 10:38 am and is filed under January 2018, Past issues. You can follow any responses to this entry through RSS 2.0. You can skip to the end and leave a response. Pinging is currently not allowed.